Each day is filled with little miracles. Yesterday, while we were having lunch in an oceanside restaurant, a German lady dressed in flowing and colorful clothes, laid two roses on the floor by my chair, hurriedly told us to guard them and then ran off as we looked on a little bewildered. She returned within a few minutes, laid one of the roses on the table by my plate and told us how she took them from an arrangement because the roses were not tended the way she thought they should be. 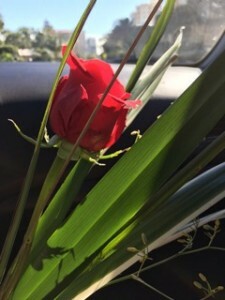 She ran off again returning a little while later handing me an arrangement of greenery she picked on the premises of the restaurant to add to my rose. energy. Do you feel it?